Want to learn how to build PowerApps, but don't know where to start? This app will guide you step-by-step through the process of building various Microsoft Office components in PowerApps. People picker: find and select people from your company directory with speed and ease. Planner: lets users assign tasks in Planner – with a description and due date. Outlook: a quick way to create and send an email – just enter an Address, Subject and your text. OneNote: a quick, easy way to enter notes into a specific OneNote notebook and section. Pop-up lightbox: presents users with helpful text when they click on an item in an app. Click here to preview the app. 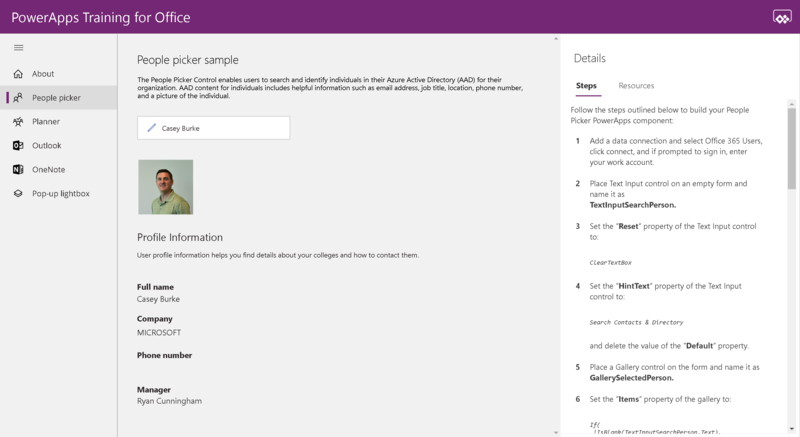 Start a PowerApps trial if you don't already have a license. Click Make this app to open the app in PowerApps Studio. Play the app to tour the functionality or edit the app to see how the various components were built. Click the Resources tab to view additional documentation and videos. Optionally, copy and past the components into your own app! As a bonus exercise, see if you can re-build the menu used in this app within your own app. We hope you enjoy this app. Keep an eye out for another PowerApps Training app we'll be releasing shortly at web.powerapps.com. As always, we're very greatful for any feedback you have!